Ok, I'm an old guy who's memory is not what it used to be. I can't seem to remember to turn off the red dot finder on my NexStar, so I'm constantly buying batteries for it (CR2032 if you're interested - I did THAT from memory!!) . So, what's the best place to put a little note to remind me. On the inside of the objective lens cover? Put there, the finder will remain on until I'm done observing but the note won't be in a "public" place. Or on the back of the scope, where it will remind me to turn it off each time I'm done using it but everybody who sees the scope will know I can't remember things? Somewhere else? Other than relying on "good old memory", perhaps take a page out of the Pilot's page book and try using a check list which you physically have to check off with a pen so that you can confirm what you actually did. It may sound silly but if it works for commercial and military pilots, why not for civilians? I am sure some enterprising DIY'er could come up with an electronic time delay off circuit. Would probably double the cost of the red dot but it would save on batteries! I can't tell you how many of those flat disk batteries I have gone through because I forgot to turn off my red dot finder. I keep it in my eyepiece case, and put it on my scope-side table whenever I'm observing or doing AP. So far, it's working perfectly. I had that problem for a while, but then I remembered the controller actually tells you to turn it off too after you do an alignment. Of course, if you don't do an alignment and you're just manually controlling, that won't be much help. I printed a label with my little label maker and stuck it on the finder itself. That way even if I forget to turn it off, since I'm constantly looking through the finder I'll eventually see it! Replace the on/off switch with a push-button or micro-switch. Put a note under your pillow. My telescope is in the observatory, 1000 feet back and 150 feet up, thru the snow, from my pillow. Forget to power-down and find that note once is all it takes... to never again forget. It's not just old guys, everybody does this. I replaced my red dot finder with a green laser and never looked back. The laser is more convenient (less bending over), more accurate in my experience, and besides, it looks super cool. Additionally, the relative scale of pointing adjustments becomes more intuitive when you can see how far in the sky the laser "point" moves for each nudge with the hand controller. Before I switched to the laser I was considering wiring the red dot finder to my mount's (zeq25) polar scope power, or to the unused aux port. No need for a time delay auto-off circuit, or automated reminder, or anything fancy like that.. the power draw from your mount is negligible and it won't hurt the LED to keep it on the whole time your mount is powered on. I like it. Kind of half-way between my objective lens cover and the back of the scope. At least I'll remember to turn it off when I change eyepieces! I second rkinnet with the green laser pointer. I tried a RACI finder, then the Telrad and put them both in the sock draw. They were killing my neck! Lasers should have only the one biased button so no problem forgetting to turn them off. I also agree with the green laser pointer. The red dot finder and Telrad are difficult to use for locating high elevation objects. I use an Orion SkyLine Deluxe Green Laser Pointer & Telescope Bracket. Best money I ever spent. It has a screw to turn the laser on and off. I scan quick to make certain there's no airplanes in the area. Also good for outreach sessions, as it shows viewers where you are looking in the sky. I too went through many red dot finder batteries before I dumped it. >make sure Night Vision Eyepiece is turned off! Follow the Nexstar alignment instructions. The last thing it says is "Turn off red dot finder" on your hand controller. After leaving it on and having a dead battery I have done two things. I have a 5 pack of spare batteries in my kit. My habit is to turn it on, use it and immediately turn it off. Double check it is off at the end of the night. Not that I'm doubting you. I can't remember ever seeing it. It shows up on the hand controller? I've probably done between 50 and 100 alignments to date. As far as I recall, it just says alignment succeed or failed and goes back to the top level prompt. Sometimes stuff scrolls across on the 2nd line so fast I can't even read it (not after alignment, but at other times). After alignment it says "Starpointer Off". Not clear to lots of folks, but once your know it helps to remind you. They say 'The SECOND thing to go is the memory...' I can't remember the first! For your particular question, what is the last piece of equipment you handle when ending your observing session? Eyepiece case? Tripod? Telescope tube? Attach a reminder to that piece of equipment in a place where you'll be sure to see it. You could even put a note on your door that you'll see when you go inside your house. I wonder if a tiny hole drilled in the top of the LED cover would allow some of its light to shine out where we can see it at a casual glance while still shining onto the glass window at the front of the finder? Of course this is not something to try on your one and only red dot finder but I think I have an extra laying around somewhere. So that's what that means. I thought it was some kind of error message. Maybe it should say "TURN THE RED DOT OFF, DUMMY". Now that I know, it WILL remind me. Edited by MAT_Blue, 12 February 2019 - 10:08 PM. Personally, I just got in the habit of checking all the battery powered things as I put them away. Multiple times. 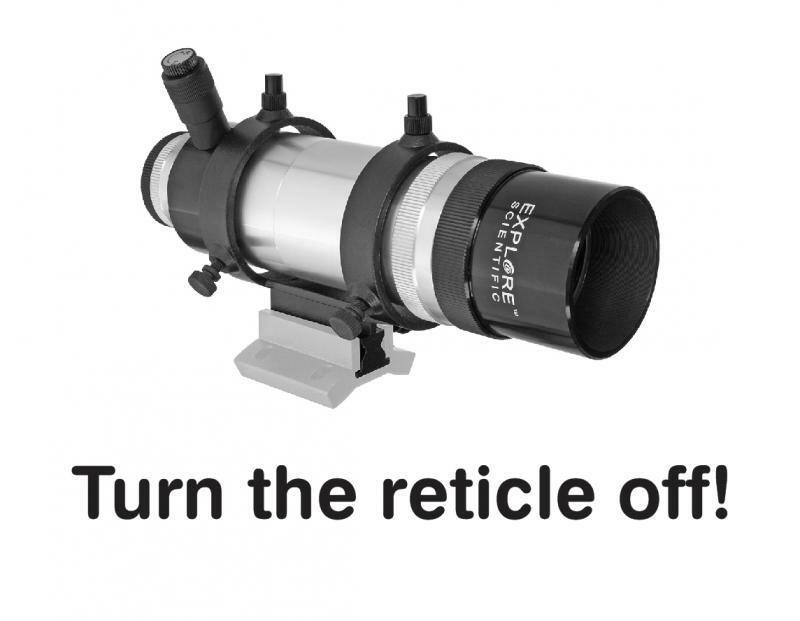 That goes for the Telrad and the illuminated reticule eyepiece. They've both been turned on and immediately off more times than I've turned them on to use them. It's like patting your pockets before leaving home. Keys? Wallet? Lacking a serviceable habit, I would suggest you use something like a small storage bag as a cover over the Finder. Take it off when you use the finder, and put it somewhere where it will be in the way, e.g. in the case with the eyepieces or over the on/off switch for some piece of equipment that you're using. That way you'll run into the bag as part of the shutdown process, and be reminded to cover the finder after turning it off. +1 For the note in EP box. However, in the UK, 'Poundland' and 'Poundshop' etc sell cards holding various sizes of these batteries. For £1 you can pick up 10 batteries of the size you require (plus about 40 of a size you don't need!). I bought a dozen of these cards three years ago, often forget to turn my RDF off, and still have plenty left. Yes, it is true, they probably "won't last as long as branded models" costing £3 each, but at £0.10 each in a situation where the absent minded means longevity isn't a worry as you don't ever expect to get a second day of use because you forget to switch off your RDF they are a sound investment! Also when Maplin went into liquidation it was selling its 4 x AA for a mere £1. If you look for "closing down sales - all must go" on the High Street, batteries and expensive energy saving light bulbs are often the 'star buys'. Edited by Noah4x4, 13 February 2019 - 04:25 AM.